When my oldest daughter was about five years old, she taught me an important lesson about not dressing someone else up in my own image. She taught me this through her "ruby shoes." 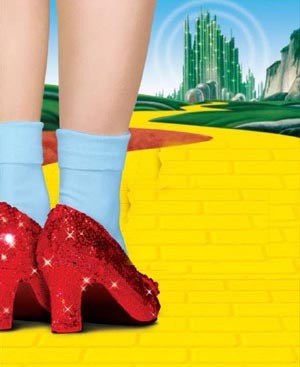 For a period of almost three years, my daughter, thanks to my older sister, owned countless pairs of bright red glittery Mary Jane dress shoes--just like the shoes that Dorothy wore in the Wizard of Oz. Abigail received her first pair of "ruby shoes" on her third birthday. Although, at that point she had not seen the Wizard of Oz. (That would come later, and it would become her favorite movie.) Abby was immediately enchanted with the bright glittery ruby red shoes. Those shoes became her most prized possession. She wore her "ruby shoes" with everything, and I do mean everything. She wore them with dresses; she wore them with blue jeans; she wore them with soccer shorts; she wore them with swimsuits; and she wore them with pajamas. I was patient with this phase because I figured she would either grow tired of wearing them or eventually her feet would grow and she would no longer be able to wear them. The day finally came that she outgrew the shoes. As we "retired" the shoes to the pile for donation, I could not have been more relieved. However, this feeling was short lived, as the next day a package was delivered to the house. It was a package for Abigail from her Aunt Stacey. When she opened the package and saw what was inside, she squealed with delight. For lo and behold, you can guess what was inside. Yes, a new pair of ruby shoes in the next size up. I begged and pleaded with her not to wear her ruby shoes with everything. I tried to appeal to her sensibilities that these were not always the most practical shoes for every activity. However, the ruby shoes phase went on for a very long time, especially after Abby saw the Wizard of Oz, and it became her favorite movie. Each time, Abby's feet would grow; my sister would send Abby a new pair of ruby shoes, the next size up. For Abby, the new pair gave her the assurance that she would always have the perfect shoes for any outfit and for any occasion. We were getting ready for a funeral, I had picked out a very beautiful velvet dress for her and shoes to match. She of course wanted to wear her ruby shoes, but all I could think was, "What kind of mother would let her daughter wear red glittery shoes to a funeral?" Frustrated, I asked her, "Abby why do you insist on wearing those shoes with absolutely everything?" She looked down at her feet for a while, rocked back and forth, and then simply said, "Because they feel like me, Mommy." She wore her ruby shoes again that day. At that moment, I realized that I was trying to dress her in my own image. I was worried about what other people might think or what other people might say. It was not about her, but about me. I thought about the times when I had tried so hard to walk in someone else's shoes instead of my own. I had forgotten how good it felt to walk in my own shoes. At times, we all forget how it feels to simply be ourselves. Sometimes we try to fit into someone else's image. Sometimes we fit others in our image. In such moments, I hope we will be able to remember how good it feels to walk in our own shoes. May we experience and recall how wonderful, how freeing, how beautiful it is to walk in our own truth and beauty. Ultimately, may we discover the joy and great delight of being who God had created us to be and desire this not only for ourselves, but for all of God's people.